As of 1 January 2016 some important changes in the social security area come into force. 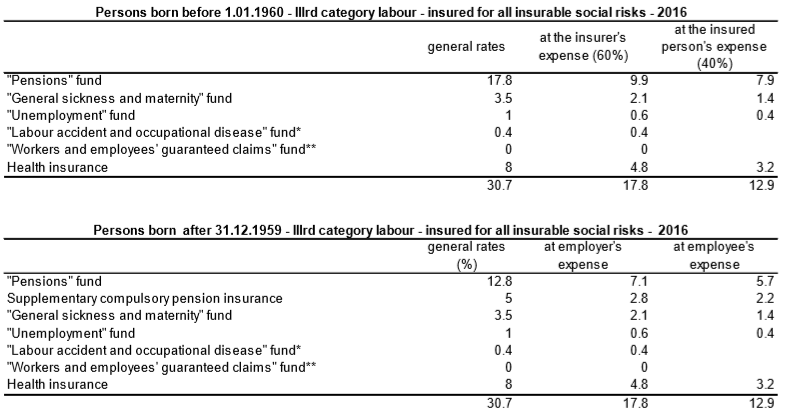 The main changes concern the increase in the minimum salary and the minimum social security income for employees, the procedure and the deadlines for presenting by the insurers of documents for payment of social security benefits, as well as the enforcement of new rules for old-age and social security periods benefits eligibility. As of 1-st January 2016 the minimum monthly employment salary is increased from BGN 380 to BGN 420. The increased minimum social security income on which contributions are paid per profession can be found in Attachment No. 1 to the State Social Security Budget Act for 2016. The minimum social security income applies to persons working under employment and management agreements. The minimum social security thresholds for self-employed persons remain unchanged. In 2016 the maximum social security income would remain BGN 2 600. In 2016 no contributions for the Workers and Employees’ Guaranteed Claims fund shall be due. In view of the above, as of 2016 insurers need to provide the necessary documents and data until 10-th of the month following the month, when the insured person presented the documents for the benefits to the insurer (before the changes the deadline was the 15-th of the following month). On the other hand, the deadline for self-employed persons would be the 10-th of the month following the month, when the documents for the benefit were issued or as of which the benefit is claimed (before the changes the deadline was the 15-th of the following month). The social security funds would provide documents by electronic means using a qualified electronic signature. The electronic filing of the documents is carried out using a web application accessible on the website of the National Social Security Institute, or by using software distributed free of charge by the National Social Security Institute, by means of a qualified electronic signature. It should be also borne in mind that following the adoption of the new Regulation on the social security benefits and aids, which enters into force on 1-st January 2016, the declarations presented by the insured persons to the insurers with regard to payment of sickness and maternity benefits should be drafted in the new template forms set forth in the Regulation. On 1-st January 2016 new rules on old-age and social security periods pension eligibility enter into force. In 2016 women will be entitled to retire at the age of 60 years and 10 months if they have at least 35 years and 2 months of social security periods, while men would be eligible to pension when they reach the age of 63 years and 10 months provided they have at least 38 years and 2 months of social security periods. As of 31-st December 2016 the retirement age and social security periods would gradually increase each year until the age of 65 both for men and women and social security periods of 37 years for women and 40 years for men. Following 31-st December 2037 the retirement age would be tied to the increase in the average life expectancy. As of 2016 persons who have the required social security periods for pension but have not reached the retirement age shall be entitled, at their discretion, to retire up to one year earlier than the required age by virtue of Art. 68a of the Social Security Code. In this case, however, their pension would be paid in a reduced amount for life. when the employment agreement has been signed after the employee has been granted a reduced old-age and social security periods pension pursuant to Art. 68a of the Social Security Code. The dismissal grounds correspond to the termination grounds in cases, where employees become entitled to the general old-age and social security periods pension. Further, in order to guarantee equal treatment of retired employees regardless of whether they are entitled to the general old-age pension or to the reduced one, the employees who at the time of the termination of their employment agreement are eligible for a reduced old-age pension pursuant to Art. 68a of the Social Security Code would be entitled to a severance payment for the dismissal in the amounts stipulated in Art. 222 of the Labour Code – the two- fold amount of the gross salary in the general case and the six-fold amount of the gross salary if the employee has been working for the same employer for the last 10 years. This Legal Alert has been prepared by DELCHEV & PARTNERS for information purposes only and does not constitute legal advice. This information is not intended to create, and receipt of it does not constitute, an attorney-client relationship. Readers should not act upon this without seeking professional counsel.